The landlocked state of Sikkim, a verdant place, is bordered with West Bengal, Bhutan, Tibet and Nepal. Nestled in the Himalayas with the diversity of culture and picturesque views, it is a beautiful place with a serene environment. Read on to learn more about these colourful fairs and festivals which add a special charm to Sikkim’s splendour. As a state with multifarious communities, the fairs and festivals of Sikkim are celebrated with glory. This thumb-shaped state of Sikkim is the world’s third largest peak. The place attracts several tourists, particularly during the winter season. The Tibetan name for Sikkim is Denjong which literally means the rice valley. 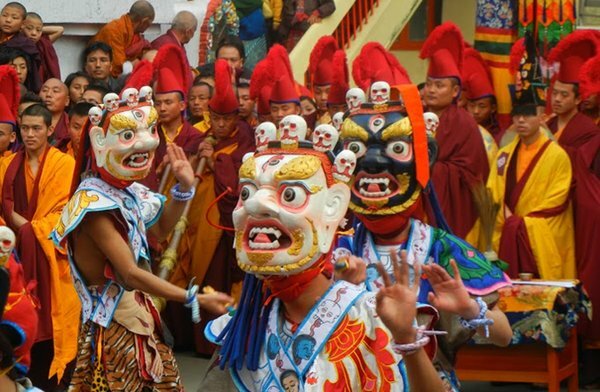 Losoong is one of Sikkim’s grand festivals since it is the celebration of the Sikkimese New Year. As per the Tibetan calendar, Losoong falls on the 10th month of every year which is generally the month of December. This year, the festival starts on 19th December. Besides the Lepchas and Bhutias, Losoong is even celebrated grandly by the Sikkimese, Nepalese and other tribal communities. The Red Panda Festival is held in the wintry months of December and January. The festival depicts the rich culture and traditions of the	Sikkimese people here. This winter carnival exhibits the tradition and culture of the Sikkimese people and has food stalls which are the main dishes of the communities and local tribes here. The Tibetan New Year, particularly regarded as the Losar, is one festival which is celebrated with a lot of enthusiasm and fervour. This harvest festival is a significant day among the Tibetans. Locals celebrate the New Year by visiting the monastery and after performing the rituals, they visit their relatives and friends. Flowers play an important role on this occasion since devotees greet each other with flowers. Though Losar will be celebrated on 16th February 2018, opting for a comprehensive Sikkim tour package in advance can be beneficial. The Kagyed Dance Festival is entirely dedicated to dance and holds deep spiritual message. Celebrated in the month of December every year, the Kagyed dance symbolises the victory of good over evil. One of the most interesting dance forms which are performed during the festival is the burning of effigies made of paper, flour and wood. Don’t you think that planning a Sikkim trip is indeed important? Quickly visit Naturecamp Travels today and treat yourself to a comprehensive tour package!